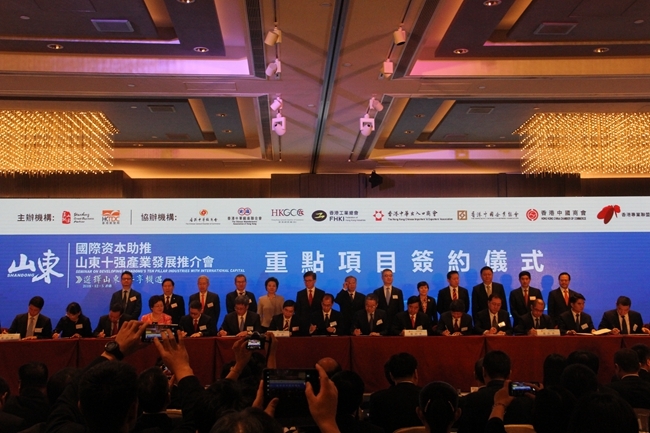 A total of 36 major projects with investment grossing $31.25 billion were signed on Dec 5 at the Seminar on Developing Shandong's Ten Pillar Industries with International Capital in Hong Kong. 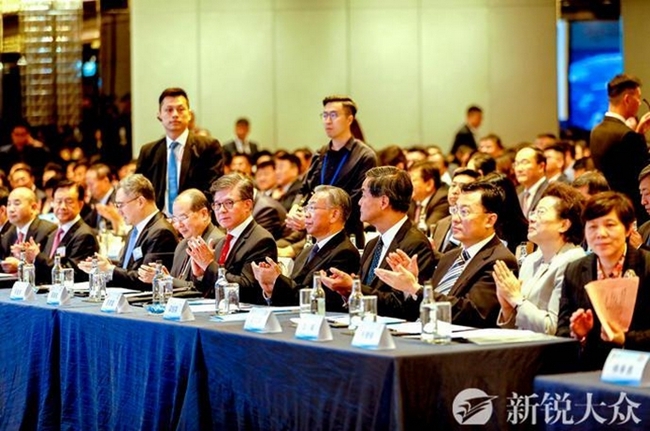 More than 600 distinguished guests from Shandong and Hong Kong including senior officials, business leaders and representatives from enterprises took part in the seminar. The seminar was part of the 2018 (Hong Kong) Shandong Week, a large-scale business campaign lasting from Dec 4 to 7 to attract investment from Hong Kong investors. Liu Jiayi, Party secretary of Shandong, delivered a keynote speech at the event. "Hong Kong, with its special status and unique advantages, plays an irreplaceable role in the process of national reform and opening-up in the new era. The visit of the Shandong delegation is a concrete action to deepen exchanges and cooperation between the two sides. In the arms of our motherland, Shandong and Hong Kong enjoy brotherly relations and share the same roots." Liu said that during the long-term stable development of the close relationship, Shandong and Hong Kong have written a brilliant chapter of mutual benefit and win-win cooperation. "With a population approaching 100 million on 157,000 square kilometers of territory, Shandong is economically strong on the national level. The province boasts vast opportunities as it is accelerating the transformation of its economic drivers from old to new and pushing forward ten pillar industries such as IT, high-tech, new energy, bio-pharmaceutical and ocean development." Liu said that Hong Kong, an internationally renowned financial, trade and shipping center, is recognized as one of the most thriving areas not just in Asia, but the world. 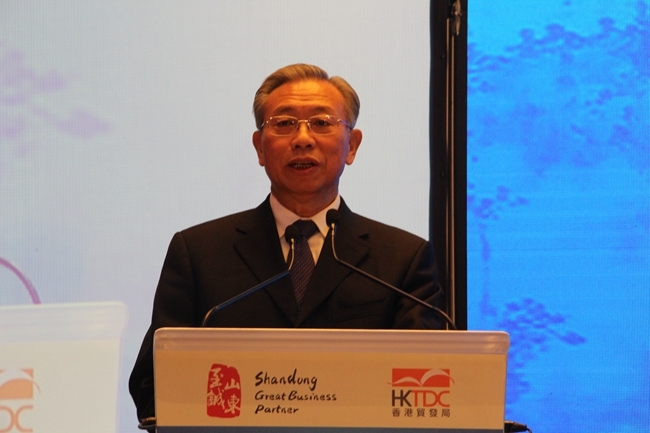 Liu said that Shandong will deepen cooperation with Hong Kong in the areas of the economy, trade, science and technology, finance, culture and tourism, increase exchanges of talents and youths, improve cooperation mechanisms, implement each other's advantages and take mutual cooperation to a new level. Liu also expressed his hope that more Hong Kong residents will visit Shandong more frequently and contribute to the province's economic development to further promote bilateral friendly and cooperative relations. 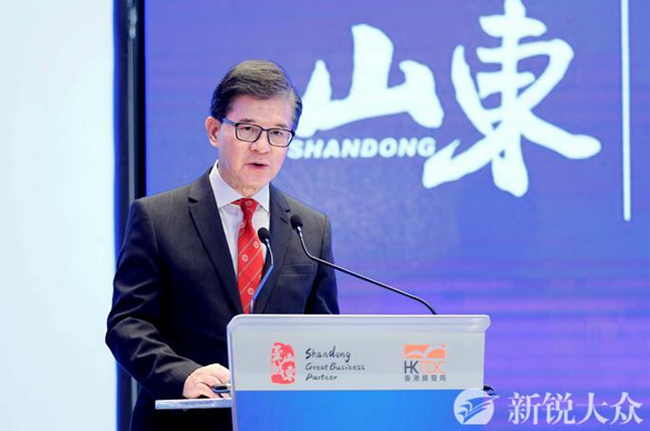 Vincent Lo Hong-sui, chairman of the Hong Kong Trade Development Council (HKTDC), said that the Shandong Week has been successfully held nine times and has played an important role in promoting the economic and trade development between Shandong and Hong Kong. Lo said that Shandong has a large economy and a strong industrial base, which are highly complementary to Hong Kong's economy. Lo said that Shandong and Hong Kong share a broader development trend as the province is accelerating economic transition and promoting emerging industries. Lo expressed his hope that the two sides will enhance exchanges and cooperation so as to give full play to the strong economic complementarity, support Shandong's rapid development and economic transition and work for win-win progress.